Houdini is the unquestionable number one! The program, written by the Belgian Robert Houdart, is known for finding tricks and resources in positions that just can�t be cracked by other engines. Now, with the release of its latest incarnation, Houdini 4, the engine has been improved significantly across the board. Its 50 Elo point boost in playing strength represents practically double the performance in analysis and engine matches. A significant element of the new version is its support of the new Syzygy tablebases, which represent the complete analysis of all endgames up to 6 pieces. * Indeed, Houdini 4 was developed with compatibility in mind and has been tuned to work with this ultramodern tablebase format to deliver the optimum in terms of precision and strength in the endgame. 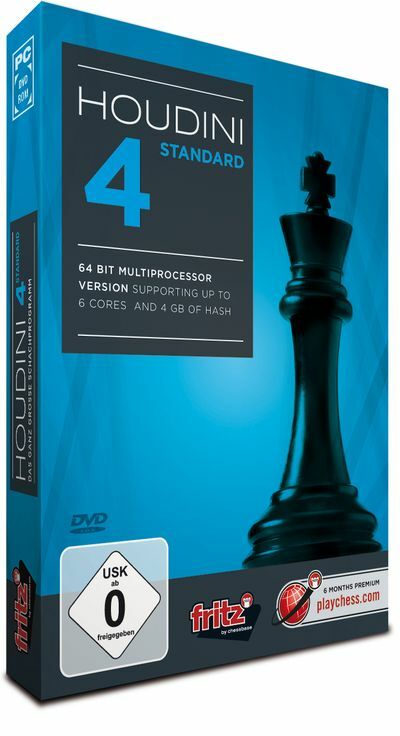 Houdini 4 also offers all the virtues and elements that made its predecessor the most popular analysis program in the chess world, but now also uses extremely precise evaluation functions that directly correlate with the engine�s expectations of winning a particular position. As well as this, the improved �tactics mode� now makes Houdini 4 the best tactical puzzle solver ever. Houdini 4 comes with the latest Deep Fritz 14 GUI and also offers the complete range of training features and analysis features included as standard in Deep Fritz 14. Database with over 1.5 million games etc.